This week is a milestone for Digital PTO that deserves to be celebrated. We now have over 1000 Parent Teacher Groups using our service. 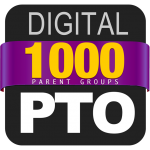 When we opened Digital PTO back in April of 2011 we were met with great enthusiasm, yet we had no idea that we would already have over 1000 schools actively using our service this quickly. It’s been less than two years and we are growing exponentially every week. Thank you to all of you who have tried and thrived and loved our service. Thank you to those of you that have been with us since the beginning and have endured some of our growing pains. Thank you to the Parent Groups that are members of our paid plans, we hope you love your enhanced features. Most of all, thank you to the hundreds of thousands of visitors and supporters of these wonderful Parent Teacher Groups that we are all trying so hard to help and support. You all are on the ground floor. You are the innovators. You are the leaders of tomorrow. We will be with you every step of the way. In the last 5 minutes, over 40 Parent Group websites were updated with new content, and in the last month more than 21,000 news articles and pages have been added by our network of schools and parents. That is a lot of communication with communities and families. Kudos to you ALL. Do you know anyone who might benefit from a Digital PTO website for their Parent Group? They can sign up for a free site here! Here’s to the next 1000 Parent Groups!